Publisher: Bloomsbury (Walker & Company), May, 2009, New York. 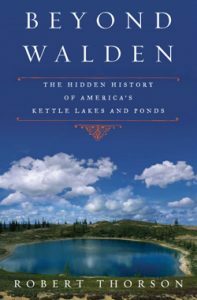 Catalog Copy: Lakes are a beloved part of the American landscape, and kettles are the most common type, spanning the northern part of the country from New England to the High Plains. Kettle lakes are depressions formed by meltdown of glacial ice and filled with freshwater. Unlike other kinds of lakes that have significant inlet or outlet streams, kettle lakes are natural wells tapping the groundwater table. Each kettle lake tells a story, and in Robert Thorson’s hands their collective saga—and the threats to their health—give us crucial insight into the dangers facing our vulnerable freshwater system. This book is now out of print, but copies are still available in libraries and online. Walden to Wobegon: Free E-book. Photo: Dust jacket design by Natalie Slocum, based on a photo taken by Galen Rowell near the headwaters of the Theron River, Northwest Territories, Canada, in the wilderness west of Hudson Bay. When I first saw her design, I realized that she had chosen the “textbook” kettle, because the same photo was in the introductory geology textbook I was using at the time.